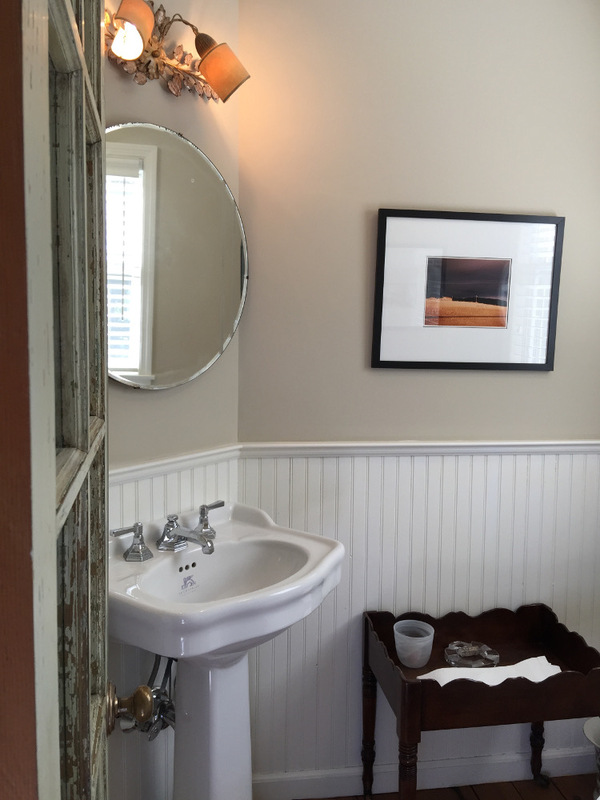 The mirror falling down led me to find a more neutral look for my tiny powder room. 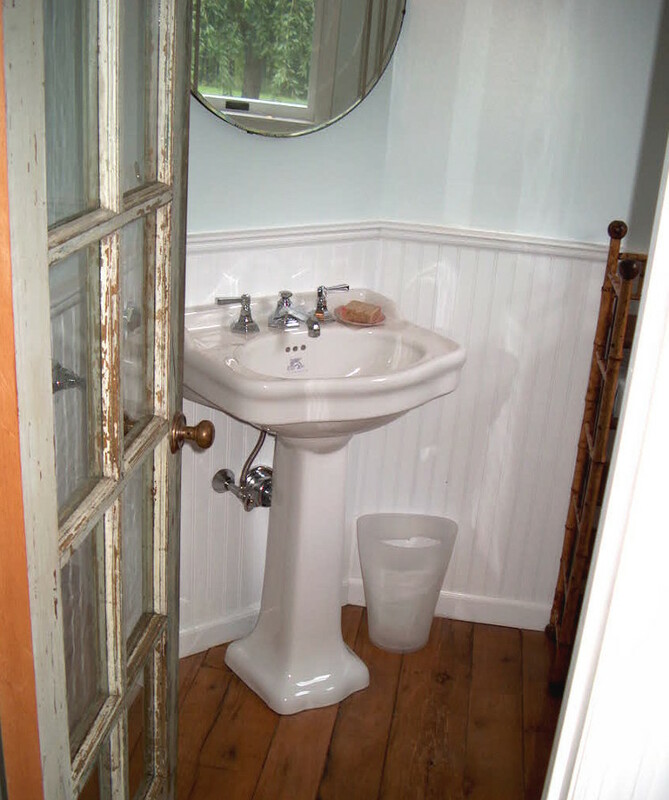 After three paint colors and a Powder Room Mirror Fail — due to a screw that rusted because the mirror hung in various bathrooms for many years — my powder room is finally settled. There’s a color change from Farrow & Ball’s green ground (above) which is an acid green to Farrow & Ball’s Stony Ground — a taupe. The 1920s framed Italian La Donna magazine covers have been replaced by some moody photographs our daughter Rebecca took on a trip through the Grand Tetons with her Dad (top photo). Repainting required removal of the Victorian bamboo étagère on the main wall. Here’s the history. The very first wall color was seafoam green, to coordinate with aqua on the inside of the salvage door. This early photo shows the salvage divided lite door before the curtain was added. Three years ago we repainted in Farrow & Ball Green Ground, to coordinate with our sun room, but the green turned radioactive at night. Last April, I added the French Door Curtain, which was Act 2 in this little space. An opaque gathered curtain is a must for a bathroom door with glass lites. After repairing the 1947 mirror by flipping it upside down and reattaching the hanging brackets with longer screws, it was ready to rehang. That presented an opportunity for the wall color change. 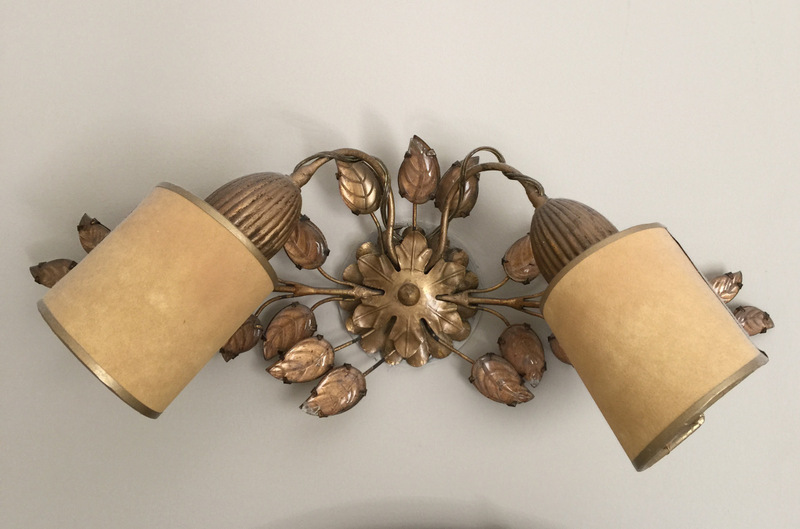 The vintage French églomisé sconce also looked better on the Stony Ground walls, I think. The bamboo shelves were pushed out into the back hallway where they immediately solved a storage problem for shoes. In its place I shifted a pie-crust edge table I bought blind in a NY auction. The table looked old but it wasn’t and the mahogany finish is much too dark for me. I plan to paint it as soon as I can decide on a color but meanwhile it serves as a handy piece for towels and other powder room niceties. I am so glad you were able to fix the original mirror! 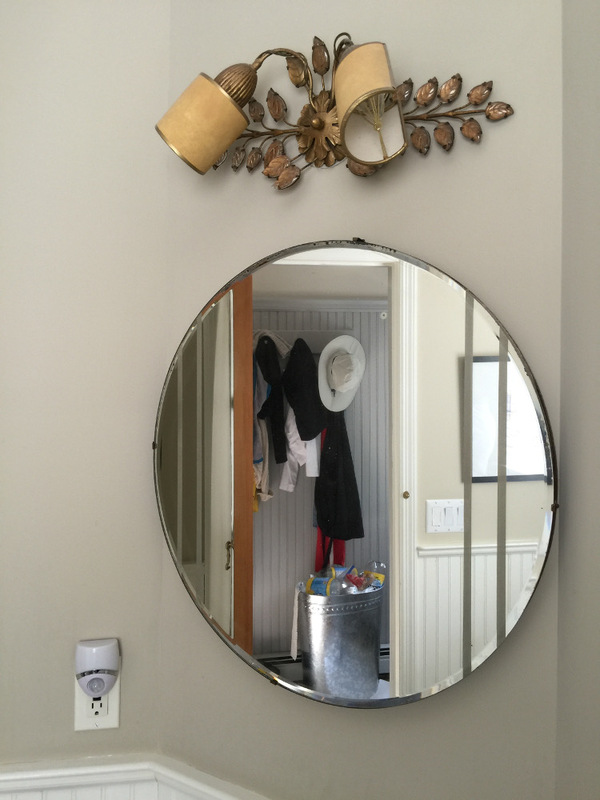 I like the other mirrors you were considering, but those old etched glass mirrors are just so special. I’ve never seen one quite like yours with the lines down the sides. 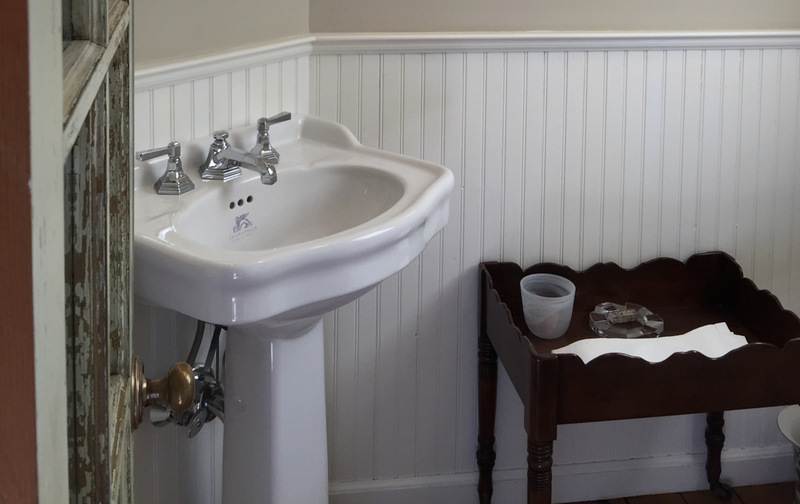 It’s a testament to the quality that it can fall off the wall onto your sink and not crack! Incredible! Can you imagine a mirror made nowadays surviving that? The room looks great. Nice job on the mirror! 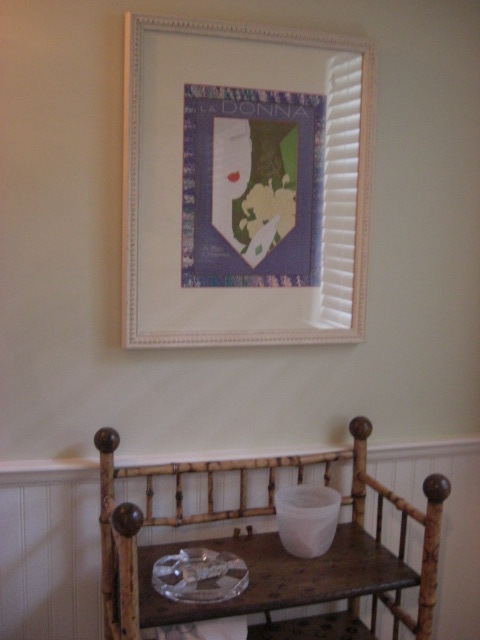 Isn’t it funny how one thing leads to another and how pieces can work even better in a new spot? Well done! Jane: I thought I had left a comment here a few days ago! well, guess it never went through. Libby, so glad you like the video idea. Keep looking for doors! You will find them.